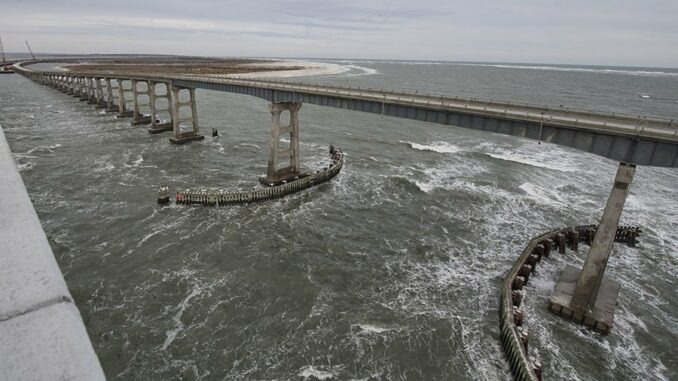 Now that demolition of the Bonner Bridge over Oregon Inlet has begun, mariners need to be aware of changes to navigation under the old bridge and the new Basnight Bridge. To avoid the continued shoaling by Bodie Island spit at the old bridge’s navigation span, a new area has been marked and lighted to the south. The navigation span is now between bents 156 and 157 of the Bonner Bridge with a 39-foot vertical clearance above mean high water and 51-foot horizontal clearance, and then between bents 23 and 24, under span 24, of the new bridge. “Please pay close attention to the aids to navigation when transiting,” said PA1 Seth Johnson with U.S. Coast Guard External Affairs/Public Affairs Detachment in Atlantic City, N.J. In a few weeks, the navigation area will move farther south where crews will have already removed sections of the Bonner Bridge between bents 173 and 176, which will have a 169-foot horizontal clearance and no overhead superstructure. Navigation under the Basnight Bridge will be between bents 21 and 22, under span 21. Once the Bonner Bridge is completely removed by the end of the year, the main navigation area under the Basnight Bridge will be marked with permanent lighting between spans 22 and 23, under span 23, with a horizontal clearance of 275 feet. The Basnight Bridge was built to allow more areas to navigate through the deepest water through the inlet, which is well south of the Bonner’s navigation span. “For more information, check out the Local Notice to Mariners at www.navcen.uscg.gov or contact the Coast Guard via VHF 16,” Johnson said. We have been using 156-157 span all winter…before demolition started…someone tell me how removing the road part affect the flow of water with the pilings still there ? ?